Flash on webOS: The quiet before the... anything? That screen you see above, that’s what shows up when you point a webOS phone to get.adobe.com/flashplayer. We’ve gone through many iterations of this screen, with the text prior to this one promising that Palm and Adobe were working to get Flash Player 10.1 onto webOS “as quickly as possible.” That came in July, and before that it was the second half of 2010, or the first half of 2010, or February, or by the end of 2009. 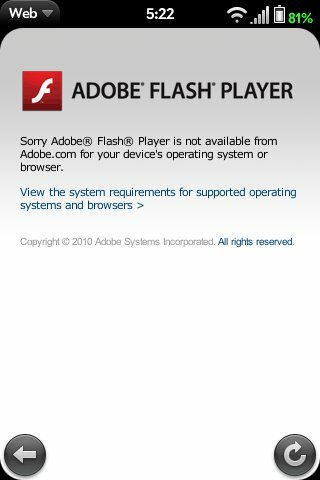 Sorry Adobe® Flash® Player is not available from Adobe.com for your device’s operating system or browser. Sad, eh? Having received this message ourselves and a number of tips from users like yourself, we decided to investigate, only to be met with nothingness. Our contacts at Palm had nothing to report, which is better than what we got from Adobe. Despite repeated requests for comment, we were met with stony silence from the folks at Adobe. So the question remains, do we even care anymore? Sure, Android has Flash Player 10.1, so long as you’re running the right version of the OS on the right device. Even then, with the massively superior hardware that we’re seeing crammed into more and more Android devices, the Flash experience is still less than ideal. It’s slow, it’s cranky, it’s resource hogging. It's, well, it's Flash. Android devices may be selling like gangbusters, but there’s still a large and influential player in the smartphone market that wants nothing to do with Flash: Apple. We’re not the biggest cheerleaders of the bitten fruit brand and their iOS operating system (though will continue to laud them for outstanding advertising), but at this point we’re understanding their position on Flash. In fact, we’re moving from understanding to agreeing. Do we want a slow and painful experience on our mobile devices? No. Nobody wants that. It’s not like Flash is really a great experience on our desktop computers, and they’re several times more powerful than anything you can fit in your pocket. There are still some things that modern HTML5 browsers cannot do that Flash can, but here’s the question: between increasingly capable HTML5 websites and fully capable PDK apps, is there any need for Flash?